This luxurious bungalow has a gorgeous location in a small holiday park by the lake and the sandy beach. The large windows in the living room overlook the entire garden and offer a magnificent view of the lake. Thanks to the central location of the open-plan kitchen, you can cook dinner without missing out on the conversations in the living room. Both bathrooms in this holiday home feature luxurious rainfall showers. The view is even more impressive when admired from one of the terraces in the modern garden. The garden leads straight to the sandy beach in front of the holiday home, where you can take a refreshing dive into the lake. The holiday park includes a small heated indoor swimming pool, two tennis courts, several boules courts and even a volleyball net on the beach during the summer. For the children, there's a playground with swings, a slide, a table tennis table, a trampoline and a climbing boulder. Fishing enthusiasts can go fishing on the lake after picking up a fishing permit at the reception desk. The holiday park on the other side of the lake offers additional options in terms of indoor and outdoor sports, including an indoor playground, water skiing facilities and outdoor group activities. 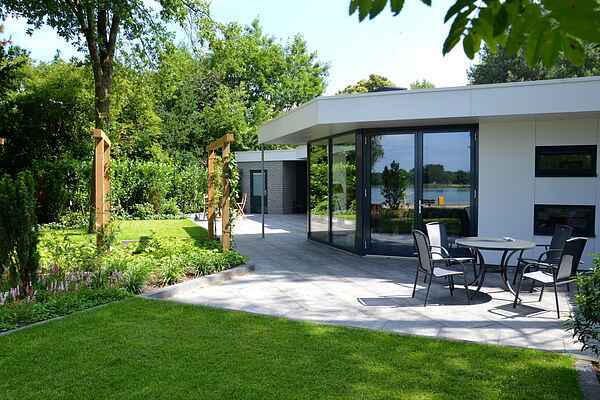 This holiday home in Erm, municipality of Coevorden, is situated on the edge of the 'Hondsrug' and characterised by wooded surroundings. The area features many walking and cycling routes across the plains, the woods and the surrounding villages. If you're bringing kids, they won't want to miss a visit to Wildlands Adventure Zoo Emmen and Plopsa Indoor Coevorden.